Many times each day we get questions about sticking to various substrates. Most questions are on something that we have already tested, so we check our large database and advise on how best adhere to the surface. Other times the request is unique and we are unsure if WEST SYSTEM® Epoxy will stick to it or not. In the event we do not have any experience bonding to a material, we recommend testing adhesion. Many times this means gluing a wood block to the surface, then pulling the block off once the epoxy is cured. The test method we use is much more quantitative than that because it measures how much force it takes to remove the epoxy. We use a piece of equipment that is specified in ASTM D4541 called the PATTI (Pneumatic Tensile Test Instrument) meter. It uses compressed air to exert a force perpendicular to the surface so we are testing true axial tensile adhesion. The values obtained are in units of PSI (Pounds per Square Inch). In order to use this method, we glue an aluminum stud down to a properly prepared surface. Next, a plastic ring is placed around the stud so the epoxy does not cling to the side and increase the bonding area. Then we let it cure at room temperature for anywhere from 1-14 days. 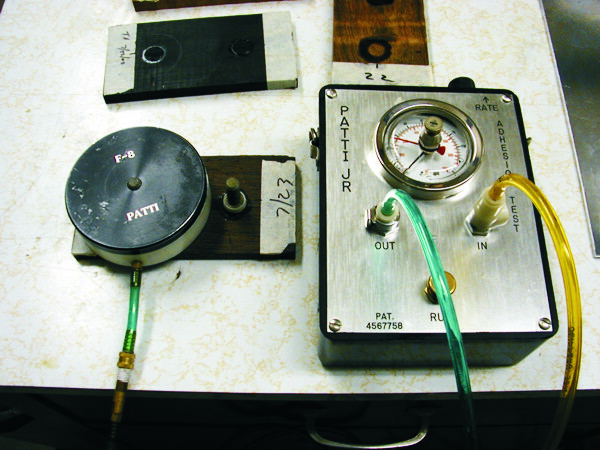 Once it is fully cured, we attach the PATTI meter to compressed air and the bonded stud and pull the stud off the surface. If the substrate fails, then we know that the epoxy is stronger and it will make for a great repair. If the bond between the aluminum stud and the epoxy fails, then the epoxy sticks better to the substrate than to the stud. The value can be considered a minimum for how well the epoxy sticks to that substrate since the bond to the aluminum failed before the bond to the surface. If the epoxy pops off the surface without much force, either the epoxy will not stick, or surface preparation needs to be re-examined. Two materials that customers have inquired about recently are granite rock and NewWood. The granite chunk that I obtained was small, so I was only able to test adhesion with three studs. But the results from the three pulls were very similar, so I am comfortable reporting these results. To prepare the stud, I sanded it lightly with 60-grit sandpaper to remove some slight high spots and cleaned it with plain white paper towel and isopropyl alcohol. The epoxy used for this test was 105 Epoxy Resin with 207 Special Clear Hardener because the customer wanted to use this as a table top. The lowest value achieved was just over 1,000 PSI. The granite broke before the epoxy pulled off the stud. NewWood is a relatively new product on the market and is made up of 50% recycled wood and 50% recycled plastic. This company sent us several 1’ X 1’ samples for adhesion testing, so I was able to experiment with plenty in order to determine the best method of treatment. Since the product contains 50% recycled plastic, it was logical to use our plastic-friendly G/flex 655 and the majority of my testing revolved around that product. The table shows that most of the failures occurred in the substrate of the NewWood, meaning G/flex stuck as well as it could have. The peel that is mentioned in the table refers to the fact that either the stud was glued down crooked, or that the PATTI meter was not flush with the surface and it was not pulled off exactly perpendicular to the surface. For more information on this visit NewWood. Do you have a material you would like to glue with WEST SYSTEM, but are unsure how well it would work? Call us at 866-937-8797 or submit your question through our email Q&A.